Honoring specific performances for the top '16-17 rookie players in the NHL, 2016-17 Upper Deck Biography of a Season Hockey is an incentive promo issued over two exclusive series sets. 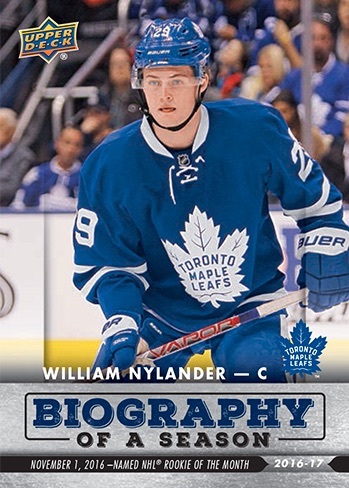 Available to collectors who spend $20 or more with Upper Deck's lineup of authorized online retailers or group breakers, 2016-17 Upper Deck Biography of a Season Hockey includes ten cards in Series 1. Starting with the beginning of the year and the amazing debut performance for Auston Matthews, the set works its way through the first half of the season with specific dates and accomplishments for the various first-year players. It also ends with Matthews and his thrilling goal on New Year's Day. 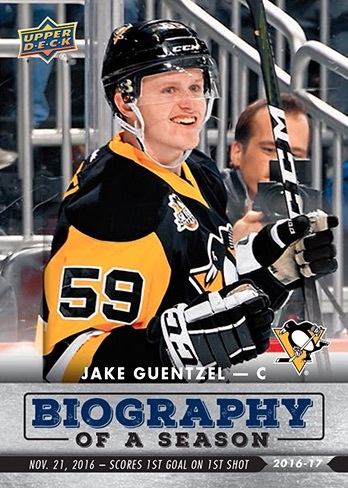 2016-17 Upper Deck Biography of a Season Series 2 naturally picks up with the second half of the year and even more rookie coverage. 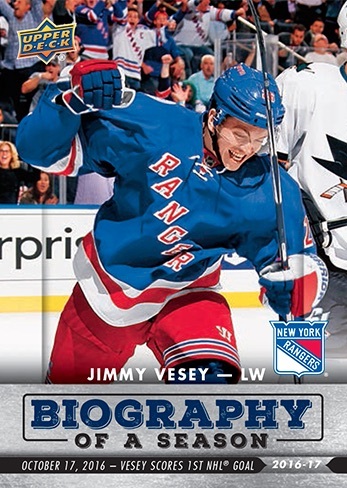 Collectors earn one random card with each $20+ purchase so it will take some time to put together the entire set. 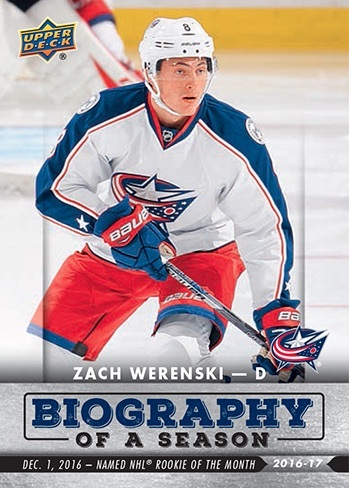 Visit the official Upper Deck site for more information about the internet retailers participating in the Biography of a Season program. 2016-17 UPPER DECK #201 AUSTON MATTHEWS YOUNG GUNS RC SP MAPLE LEAFS MINT!! 16-17 UD The Cup MIKE REILLY Gold Rookie Patch Auto 17 24 RPA ARP SICK PATCH! 16-17 UD The Cup MIKE REILLY Gold Rookie Patch Auto 15 24 RPA ARP SICK PATCH! 16-17 UD The Cup MIKE REILLY Gold Rookie Patch Auto 24 24 RPA ARP TOP PATCH! 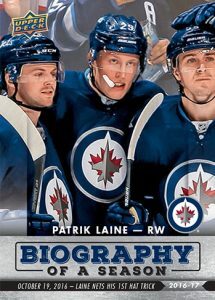 October 12, 2016 - "Scores 4 in Debut"
October 17, 2016 - "Vesey Scores 1st NHL Goal"
October 19, 2016 - "Laine Nets His 1st Hat Trick"
October 27, 2016 - "Registers 3 Points in Win"
November 1, 2016 - "Named NHL Rookie of the Month"
November 8, 2016 - "Logs 2nd Hat Trick of the Season"
November 17, 2016 - "Marner Wows Against Reimer"
November 21, 2016 - "Scores 1st Goal on 1st Shot"
December 1, 2016 - "Named NHL Rookie of the Month"
January 1, 2017 - "Scores OT Winner in the Classic"